In Mexican communities, capitalism kills. Since mining companies began extracting titanium and other minerals in 2005, the Acacoyagua municipality in the Soconusco region of Chiapas has seen a substantial increase in the number of new cases of lung, pancreatic, skin, colon, and liver cancer among residents. According to documents obtained from the Mexican Civil Registry, by 2015, cancer accounted for more than 22 percent of the total deaths in Acacoyagua, many of them children and young adults. Just as the health effects of mineral extraction projects have proven deadly for local populations, so, too, has expressing political opposition to them. In 2009, Mariano Abarca, the leader of an anti-mining movement in Chiapas, was assassinated and Canadian mining firm Blackfire Exploration Ltd., allegedly tied to the murder, was accused of human rights abuses and corruption. 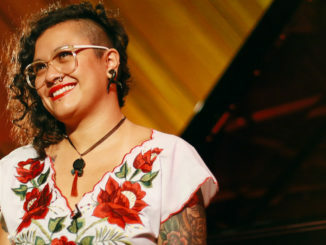 In 2016, Gustavo Castro, director of Otros Mundos, an organization in Chiapas whose mission is to create alternatives to global capitalist expansion, was collaborating with Honduran activist Berta Cáceres when he and Cáceres were both shot by unknown gunmen. Castro was taken for dead and survived. Cáceres’ murder came after the Honduran hydroelectric company, Desarrollos Energéticos S.A., waged a campaign to slander Cáceres, labeling her an anarchist, a threat to Honduran sovereignty itself. Castro, now living in exile for his own safety, communicates virtually with his team on the ground in Chiapas, who continue organizing communities in defense of their land, water, and territory. This trend follows an alarming pattern for activists throughout Latin America. According to Global Witness, from 2010 to 2015 in Mexico and Central America alone, an estimated 194 environmental activists were murdered. In each case, the process is much the same: governments and transnational corporations systematically criminalize grassroots resistance movements, delegitimizing their causes and dehumanizing their supporters. In Mexico, environmental activists are subjected to arbitrary arrests and detention, repression at peaceful protests, defamation, demoralization, and false charges. These actions provoke the use of violence against activists and, when their murders are left uninvestigated and unpunished, work to institutionalize violence as a legitimate strategy for silencing political opposition. In the same way that depictions of Mexican immigrants as criminals increases their chances of being killed at border crossings, the criminalization of environmental activists increases the likelihood of their persecution and death at the hands of interested state and private actors. Over the last several decades, a series of structural reforms opened Mexico to greater foreign direct investment. Beginning in the early 1990s, Mexico pursued an aggressive privatization model in preparation for the North American Free Trade Agreement (NAFTA). These trends accelerated under subsequent administrations, particularly that of current President Enrique Pe?a Nieto, who took office in 2012. Constitutional reforms facilitated the privatization of previously communal lands, while subsequent mining legislation provided transnational mining companies with expedited access to, and control over, the exploration and exploitation of minerals throughout Mexico. A 2005 reform of the original 1993 mining law allowed the government to grant mining concessions for up to 50 years and eased the process of contract renewal following that period. Energy reforms beginning in 2013 also resulted in increased privatization of petroleum and hydrocarbon production. During the same period, the U.S. and Mexican governments enacted policies to heighten security throughout the country under the pretense of curbing illicit drug flows and securing Mexico’s borders. The U.S. has invested billions of dollars in the militarization of Mexico since 2008 through the Mérida Initiative, increasing access to arms and high-power weaponry, militarizing local and national police forces, and providing extensive military training. The combination of economic deregulation and repressive security policies has allowed the Mexican government to facilitate foreign investment in Mexico by expanding militarized control over resource-rich areas. In partnership with the state, mining companies deploy security agents, military forces, and hired hitmen to silence community opposition to the megaprojects, restrict access to mining sites, and threaten the safety and security of residents. The result has been the widespread use of state-sanctioned violence in the name of protecting and growing transnational capitalist interests. In Chiapas state, the abundance of natural resources makes the region particularly vulnerable to violent territorial control by the Mexican government. The expansion of mining concessions in Chiapas – currently there are a total of 99 – correlates with a profound increase in military presence. The state is littered with military checkpoints, barracks, encampments and bases, and the construction of additional military centers continues today. 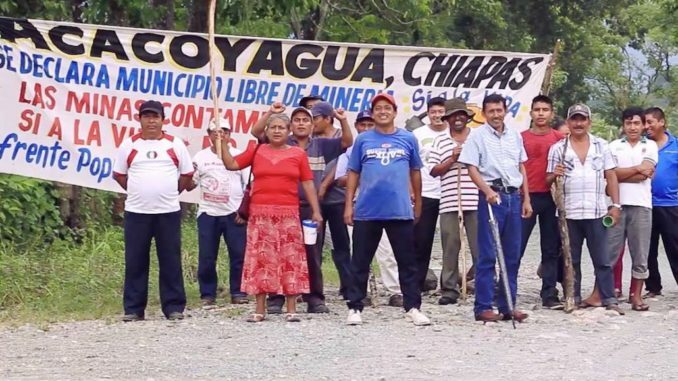 It is within this environment that Acacoyagua residents began to fight back. In Acacoyagua and elsewhere, the Mexican government and its corporate allies use a variety of illegal tactics to convince local communities that their business is socially responsible. These include bribery, extortion, creating social conflict, spreading misinformation, and extending promises of job creation and development of schools, stores, and infrastructure. 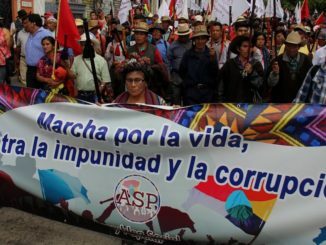 After 10 years of deception and devastating health outcomes, Acacoyagua residents organized in defense of their community ?and territory, forming the grassroots resistance movement called FPDS – Frente Popular en Defensa del Soconusco 20 de Junio, or Popular Front in Defense of Soconusco 20th of June. Last year the FPDS brought the Acacoyagua case to the Ministry of the Environment and Natural Resources, a government institution claiming to protect Mexico’s natural resources and prevent and control contamination. The FPDS discussed the community’s health problems and showed photo evidence of water contamination and the harmful effects of chemical runoff from the Mexican-owned Casas Viejas titanium mine, which spans several several ejidos in the Acacoyagua municipality. Ministry staff responded by turning the group away, calling their assertions illegitimate and unfounded. Soon after, Mexican state police and El Puntal S.A., the corporation that runs Casas Viejas, began to threaten and harass members of the FPDS. The company distributed flyers denigrating the organization and published defamatory remarks about its members in the local newspaper. On July 31, 2017, the radio station Bestia Grupera Huixtla transmitted a segment in which broadcasters narrated a confrontation between community members in Acacoyagua and the FPDS, who set up a roadblock to ensure no mining trucks or equipment passed through. Segment announcers mentioned nothing of the purpose of the FPDS and the context in which they resist. Instead, they vilified the FPDS, and, according to eyewitnesses, portrayed them as a violent organization in an attempt to pit the community against them. ??? On June 20, 2017, the FPDS celebrated two years of struggle against open-pit mining in the Chiapas municipalities of Acacoyagua and Escuintla. Despite continued attempts at division and public defamation by El Puntal and the Mexican state, the Casas Viejas and El Bambú mining projects have been temporarily suspended. With the support of Otros Mundos and the Red Mexicana de Afectados por la Minería (Mexican Network for those Affected by Mining), the FPDS continues to advocate for its member communities, disseminate its story at the local and national levels, and demand the dissolution of all mining concessions in the region. But the struggle is not over. As activists are brutalized, the Mexican government continues to work in partnership with transnational extractive industries to maintain the status quo. The growth and expansion of profit-generating mineral exploitation initiatives depends on their ability to criminalize dissent in order to justify the violent suppression of dissenters. Mining companies are given free rein to dispossess local populations of their land and strip them of their rights to life, mobility, and freedom of expression. And while Mexico’s official discourse emphasizes democracy, security, and development, internally the Mexican state is deteriorating under astonishing levels of corruption and impunity, collusion with private interests and criminal groups, and major gaps in transparency and accountability. As outsiders looking in, we must ask ourselves – who are the real criminals and how should we respond? Kaelyn DeVries is a Master of Arts candidate in International Security at the University of Denver’s Josef Korbel School of International Studies. This article was written following her participation in a human rights delegation with the Denver Justice and Peace Committee, and alongside activists at Otros Mundos, to learn about the political, environmental and security impacts of transnational mining initiatives in the region. Copyright, Upside Down World. May not be reprinted without?เล่นคาสิโนออนไลน์ให้ได้เงินpermission. ?